I'm a luker. I've been telling myself I would do these scrapbook and card challenges one day to encourge me to create and use up my stash! I've been thinking that for over a year! Well... I DID IT! 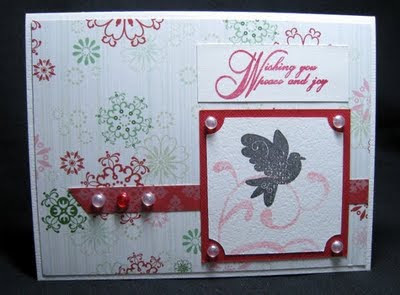 Here is my first blog challenge entry for Sketchy Thursdays card sketch on November 28, 2009! I have decided to try a little more stamping. 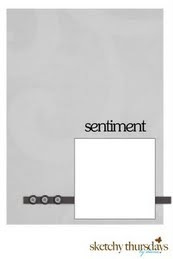 I just bought this set of stamps from Little Paper Shop. 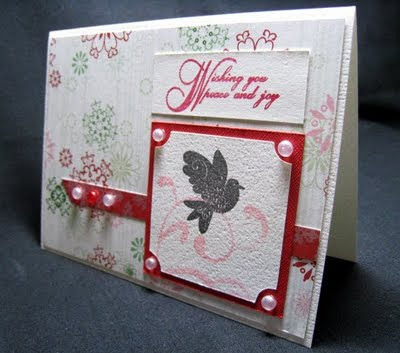 I stamped on a textured cardstock for a different look. For the red pearl I just coloured a white one with my copic marker! All I did was turn mine on its side! Being fairly new to stamping, I had to stamp the sentiment three times! The last time, I decided to try red. Sometimes those little boo-boos are blessings in disguise! I like how the red turned out better than plain old black. Hope you like my novice entry! Very pretty. Love the way the textured c/s looks. Thanks for playing along with us!